This artwork is currently up for auction at eBay. See the auction here..
My drawing is based on one very moving, very haunting scene from “The Grapes of Wrath”. I have depicted Rose of Sharon embracing the starving man as she is about to nurse him from her breast. A controversial scene that the publishers wanted Steinbeck to keep out of the story. However, because of it's importance to him, he fought for it to remain intact and so they published it. "Rose of Sharon loosened one side of the blanket and bared her breast. 'You got to,' she said. She squirmed closer and pulled his head close. 'There!' she said. 'There.' Her hand moved behind his head and supported it. 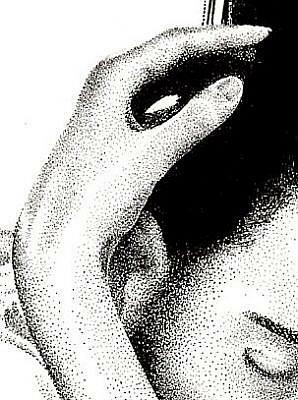 Her fingers moved gently in his hair. She looked up and across the barn, and her lips came together and smiled mysteriously." When I started researching and thinking about how I would illustrate this moment I decided that I wanted to emphasize the compassion and hope that I believe Steinbeck was trying to portray. Although Rose of Sharon had just lost her baby in childbirth she was able to give a starving man her breast milk, one of the only foods that his emaciated body would be able to keep down. Steinbeck wrote his stories with many underlying messages and political statements that reading through them just once would not be enough. This particular scene alone has many meanings to me. It is a statement that we can find hope even in the bleakest situations, that tragedy can be overcome, and ultimately humanity will prevail. 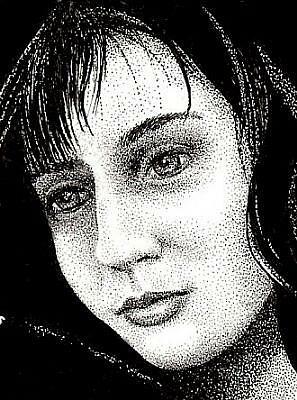 I created it with a pointillism technique using various sized Rapidograph pens and black india ink. The ground is Crescent Illustration board.